The Xerox WorkCentre 5955 Multifunction printer that combines the processing power and flexibility of a remote printer, fax, scanner and photocopy, a compact machine, ideal for busy offices and complete work areas with sleek lines and monochrome finishes. It can also send and receive emails and can be remotely controlled via the hand-held unit. Additional optional functions include RFID card readers and Wi-Fi capabilities. Functions are controlled from the LCD screen on the top panel of the unit. 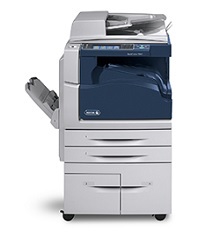 Xerox WorkCenre 5955 has a compact design 33.5 x 26.2 x 45.3 inches and lightweight 249 lbs. The printing speed is impressive 45ppm, and the editing resolution of 600x600 dpi is more than enough for most office needs. The LCD panel on the front of the unit uses a series of icons and buttons to select various functions and control multi-tasking. Ethernet is built and has USB 2 connectivity for inserting and storing material. The engine has a powerful 2GB Dual-core processor in its heart. The Xerox 5955 performs traditional heavy-duty printing, scanning, copying and faxing functions and is brought to the Internet era with USB 2, Ethernet and email capabilities. It can be controlled proximally or remotely, and its networking capabilities combine a full set of security features, including 256-bit encryption. Any busy team will benefit from having this powerful multi-tasking unit in its center of operations. Download the Xerox WorkCentre 5955 driver according to the Operating System on your PC or laptop at the link below.